I spent the earlier part of my day scrubbing the last of the blinds and wiping down ceiling fans. 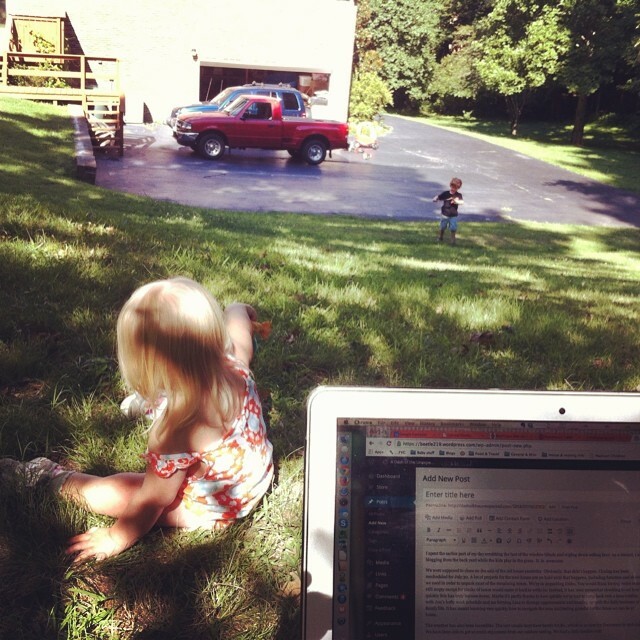 As a reward, I am blogging from the back yard while the kids play in the grass. It. is. awesome. We were supposed to close on the sale of the previous house yesterday. Obviously, that didn’t happen. Closing has been rescheduled for July 30. A lot of projects for the new house are on hold until that happens, including furniture and shelving we need in order to unpack most of the remaining boxes. We’re in unpacking limbo. You would think having entire rooms still empty except for boxes would make it hard to settle in. Instead, it has been somewhat shocking how quickly we have felt at home. Maybe it’s partly because we’ve had to quickly jump back into a busy routine, with Jon’s hefty work schedule and me ferrying Lina to therapy appointments and keeping up with the daily business of family life. It has meant rapidly learning how to navigate the area and feeling grateful for the times we can be at home. The weather has also been incredible. The last couple days have barely hit 80, which is so rare for Tennessee in mid-July. We have spent hours enjoying the outdoors. I say all this not to brag, but to say how truly grateful we are for this little spot where we can be at home, even amidst the continued moving mess. Life will be exhausting and rather chaotic for a while, but we have been able to carve out some bit of normalcy, for which I am truly thankful. And now the awesomeness has ended and both kids are fussing to go inside. Break over – time to head in.